Guess what recently turned forty years old? 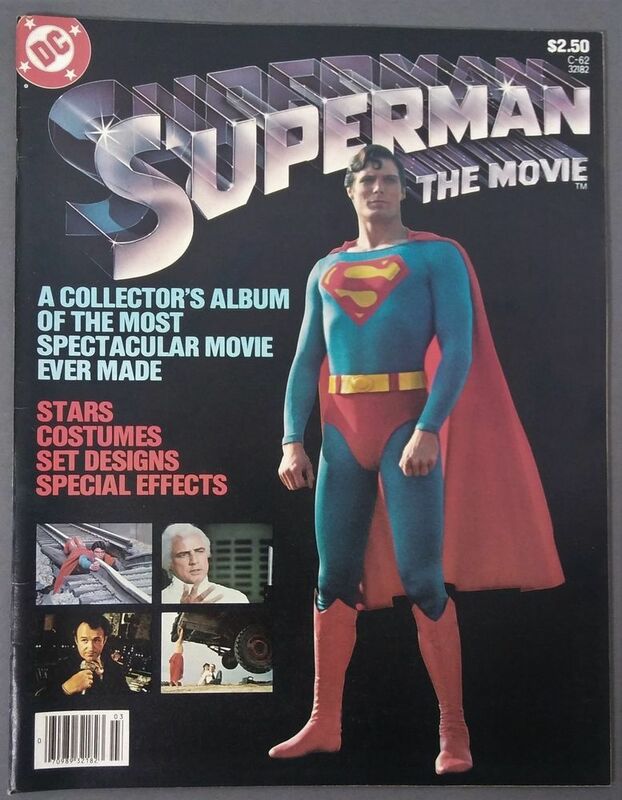 Superman: The Movie had its wide release on December 15, 1978, so technically the true fortieth anniversary was last month, but since this is a personal blog and I’m pretty sure I didn’t see it until early January of ‘79, my own personal anniversary of seeing the film would be right about now—so here we are. I’m not the only one celebrating this milestone. The most recent entry of Back Issue (#109, Dec. 2018) was a special, all-Superman: The Movie issue—digital edition available via the TwoMorrows website. In addition, there’s a great article at Bleeding Cool here; great interview with director Richard Donner at Den of Geek! here; an article from Parade magazine here; an editorial from Rotten Tomatoes outlining the “Five Ways Superman: The Movie Defined The Superhero Genre” here; another look back on the film at Comic Book Debate here; a 35th anniversary post originally published five years back on Caped Wonder here; and Big Glee! has a contemporaneous Newsweek article here. Now last year, in the wake of the release of The Last Jedi, I thought it would be both interesting and fun to go back and look at an old, contemporaneous review of the original Star Wars movie in the pages of The Comics Journal. As that little experiment proved rather fruitful, I figured I’d try it again here with the original Superman film. I believe you’ll find the results somewhat surprising. 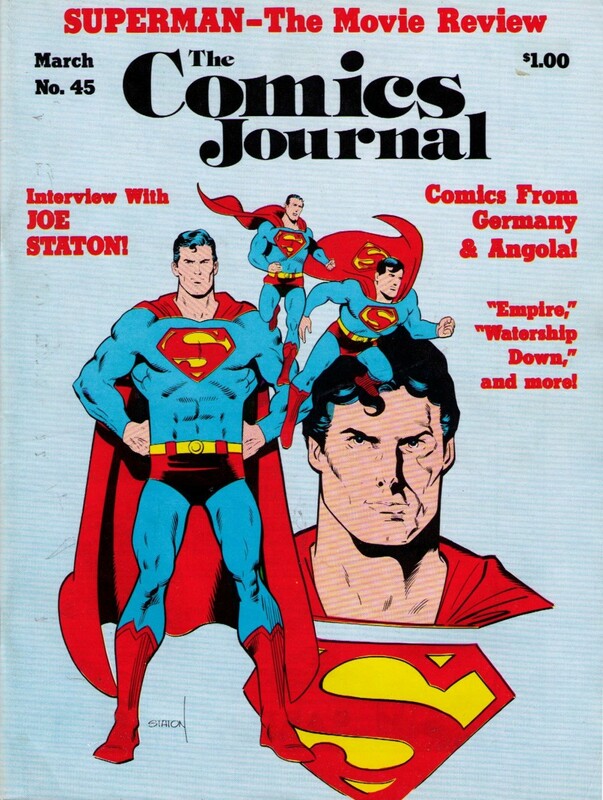 Cover of The Comics Journal #45 (March 1979), illustrated by Joe Staton. Dwight R. Decker’s comprehensive review of the film appeared in The Comics Journal #45 (March 1979, pp. 46-53). By the second paragraph, he lays his opinion on the line for the world to read. And what could have been a magnificent, definitive film treatment of one of America’s great folk heroes instead shows every evidence of the many hands that were laid upon it, and remains an erratic collection of disparate scenes that individually range from the utterly splendid to the despicably camp. I [was] determined to give Superman every benefit of the doubt. To that end, I sat through it no less than three times—and found to my surprise that I could have managed even a fourth if Sitzfleisch hadn’t been setting in. By then I had certain favorite scenes that made enduring the others worthwhile. Right off the bat, Decker had a problem with the depiction of Superman’s home planet. Krypton is shown as bleak and desolate, a barren expanse of chalky plains broken by clumps of dead white, rocklike outcroppings that turn out to be cities. If there’s a real, breathing society here, we don’t see it. What the movie people were trying to do is clear enough: portray a truly alien culture…. But Superman is the wrong film for that approach. …a Krypton dying of old age, a bleak Krypton as white as a desert-scoured, sun-bleached skull, evokes little regret or grief when it finally does expire. John Byrne kinda, sorta took this same road with his Superman reboot in ’86, making Krypton a cold, passionless society, and this was a mistake. As a reviewer for Amazing Heroes put it at the time, Byrne rendered Krypton “a purgatory escaped rather than a paradise lost,” which robs Superman’s story of much of its heft and nearly all its tragedy. But in the movie, Kryptonian society only appears cold on its surface when we first see it. As the film goes on, the Jor-El scenes clearly show just how much compassion and love he feels, particularly for his wife and son. Also, I’m fairly sure the look of Krypton was a design/production decision, not a writing decision. And while the Kryptonians would seem a race of old people without vitality based on what we’re shown, keep in mind the few people we see are all authority figures of high political office, and such people tend to skew older. Had they delved a bit deeper into Kryptonian culture, I’m sure we would have seen some younger actors playing younger characters and the culture would have felt much more vital and alive. Decker found a lot to like about the Smallville scenes of Clark Kent’s youth. The scenes of Clark Kent growing up in Smallville are marvelous, hitting just the right serious note. Still, he rags on the confusing passages of time and bad science in the film, like the inconsistencies in how long it took Supes to get from Krypton to Earth, how the years never line up, and the fact that Superman spent twelve years at the North Pole (the entirety of his 20s!) learning from Jor-El’s ghost—and he’s 100% on point with it all. But from my perspective (particularly from my point of view seeing it for the first time as a nine year old), they got all the basic beats right: Supes escapes from an exploding Krypton as a newborn, lands outside Smallville, gets raised by the Kents and grows up to be Superman. As long as they hit these beats as they did, the minor inconsistencies in the smaller details don’t take away enough from the larger narrative to compromise my enjoyment. And by the time Clark Kent is Superman, we’re in agreement once more. But finally, after about two reels, there stands Superman. Proud, tall, in a bright blue, red, and yellow costume that seems to fairly glow. Of course, this is merely the first glimpse the audience gets of Superman before he reveals himself to the larger world in even more dramatic fashion. Decker likes Marc McClure as Jimmy Olsen, doesn’t like Jackie Cooper as Perry White, and disparages Margot Kidder’s Lois Lane as a sort of re-heated Rhoda Morgenstern—“a Hollywood version of a Noo Yawk woiking goil.” (Rhoda Morgenstern, as played by Valerie Harper, started out as a supporting character on the Mary Tyler Moore Show before spinning off into a show of her own. Rhoda was a streetwise, no-nonsense, tough-talking New Yorker, who stood in stark contrast to the sweet, sunny, Midwestern Mary Richards, as played by Mary Tyler Moore.) While Decker’s view is essentially correct, I don’t see this approach as a bad thing, necessarily. The comic-book version of Lois was was always fairly one dimensional, so the movie characterization gave her a pinch more depth, at least. And I’m into street-smart chicks so I liked it. To digress for a moment here, I’ve heard many comics fans over the years express a distaste for Margot Kidder in this role, usually because she’s simply not “beautiful” enough to believably capture Superman’s fancy as she does. I never really agreed with this, and even if I had, I’m sure I would have been swayed to the other side of the argument after seeing the screen tests for the part of Lois, which have been part of the bonus features on nearly every edition of the DVD and blu-ray releases of the film. If you haven’t had the pleasure, portions of the screen tests for Anne Archer, Lesley Ann Warren, Debra Raffin, Stockard Channing, and Susan Blakely (in addition to Margot Kidder) were all part of it. While it’s intriguing to think of what these other actresses might have done with the part (and all the performances were really quite good), I don’t see how anyone could deny that Kidder was the best, most natural Lois. Like anyone with an iota of taste, Decker loved Christopher Reeve’s portrayal of our titular hero. But Chris Reeve…! Now here we’ve got something. He is Superman. He is also Clark Kent, and he plays the two parts as differently as Bill Bixby and Lou Ferrigno play theirs [as Bruce Banner and the Hulk, respectively, on the then-contemporary Hulk television series on CBS]…. by God this Superman measures up! Probably the single most effective scene in the entire film is Superman’s first public appearance. Lois Lane’s peril looks only too real, and the reaction of the crowd below is authentic and involving. The theater audience is genuinely caught up in the tension. There’s a minor sight gag when Clark Kent briefly glances at a modern phone booth, but for the most part the scene is milked for all its drama. And when Clark Kent changes to Superman and leaps into the air to catch Lois, the effect is cathartic. Both the street crowd on the screen and the audience in the theater clap and cheer. The feeling is good, one of enormous benevolence. The people in the crowd have no idea who the man in the costume is or how he can do what he’s doing; they only know that their horror at what looked like certain disaster has suddenly been replaced by wonder, that a miracle that no one had a right to even hope for has just taken place. It is the best scene in the film. By 1978-79, Superman had held an iconic spot in American pop culture for forty years. The audience was well aware of essentially all the Superman tropes, particularly the one with Clark Kent deciding “this is a job for Superman!” and ducking into a nearby closet or phone booth momentarily before dramatically re-emerging as Superman. It was a scene that was almost universally anticipated, and over an hour into the movie, almost halfway through, they (we) finally get it—Superman leaps into action and that anticipation is immensely rewarded. The whole sequence was impeccably performed, paced, and edited. Every action, every word of dialogue, is simply perfect. And yeah, talk about catharsis! For forty years now, it still… STILL makes my eyes well up with tears of joy and I leap up so high out of my seat that I nearly bang my head against the ceiling. Clark Kent enters that revolving door, the trumpets of John Williams’s PERFECT score blare, and I am over the moon. Not only the best scene of the movie, but one the best scenes in the history of cinema. As mentioned, it was the height of the film for Decker. Then things start to go downhill. It’s the sort of thing that makes a comics fan of normal instincts want to kidnap the scriptwriters and director, tie them to chairs in a locked room somewhere, and scream at them for a few hours. The Luthor segments are camp at its most abominable, an unbelievable betrayal of everything the movie has tried to be up to that point. And how would Superman be presented? As an authentic, dynamic hero? Or as a contemptible, smirking parody of himself? Comics fans remember with fear and loathing the 1966 Batman TV show with its ghastly “camp” approach. Why didn’t Adam West show up in a Batman costume, say “Stand aside, Superman — these birds are mine!” and let the movie get on to better things? As presented here, Lex Luthor and company are simply not worthy opponents for a hero of Superman’s stature. This part of the review gives you good idea of just how scarred then-comics fans were by that sixties Batman series. According to Merriam-Webster, camp is “something so outrageously artificial, affected, inappropriate, or out-of-date as to be considered amusing; a style or mode of personal or creative expression that is absurdly exaggerated and often fuses elements of high and popular culture.” That Batman show was most definitely all these things; it was pure camp. Everything and everyone in it was a ridiculous joke—Batman most of all. There’s nothing to laugh about as Lex is laying that kryptonite on Superman—he’s sinister and terrifying. Yeah, there’s the line about Hackensack, but at that point in the proceedings it was a well placed tension breaker (in addition to being damn funny). There’s nothing camp about any of it. Luthor is serious, Superman is serious, the whole situation is dead serious—which is why the accusations of camp strike me as rampant paranoia. In more recent years, the thing that director Richard Donner has been most lauded for is that he took Superman seriously. His keyword during filming was “verisimilitude” (as noted in several of the links I put up at the beginning of this post). Once again, the dictionary definition of verisimilitude is the “the appearance of being true or real.” Now no superhero story can ever truly be “realistic,” but what the word verisimilitude is meant to convey here is that everything feels “real” within the context of the story. It’s the highest level of realism that can likely ever be reached in a superhero tale. But getting back to my point: Even then, at the time the film was released, Richard Donner said (in the treasury) that, “Superman must be treated straight. The minute you lose the truth or the fun of it or begin to parody it, you destroy the line of tension, the honesty.” So while the film has a lot of humor in it—wonderful humor, in fact—it is in no way camp, nor was it ever intended to be; certainly not after Donner took the reins. At the same time, I can forgive Decker for being overly sensitive about the issue. That Batman show, while widely loved and appreciated now, really made comic book readers into objects of ridicule way back when. Superhero comics were universally derided as ridiculous and anyone who took them seriously were wasting their time and/or just plain stupid. Treating them like the joke they were perceived to be was the only way a show like Batman could have even been made back then. So when superheroes started making a comeback to television and movie screens in the mid to late 70s, comic fans were naturally uptight about their favorite characters being turned into punchlines again. The movie has two endings. I think I liked the first one better. Up to that point, the writers had a choice either leave the woman dead or don’t get her killed off in the first place. But when Superman makes it didn’t happen, the thinking fan can only groan. If Superman can do that, he can do anything—and who cares what he does do? It’s a deus ex machina, a solution to the problem yanked out of left field and unjustified by anything that came before, and thoroughly unsatisfying. I’m disagreeing again here. Is the rescue of Lois a deus ex machina? Yes, but this is kinda the point. Superman is virtually all-powerful, but does having this power mean he has the right to use it? It’s a deep and timeless question. In the end, if it means Lois Lane gets a second chance at life, then the answer for Superman is yes. And what a dramatic moment this was. In the comics, the movie serials, the cartoons, television, Superman always saves Lois Lane. To see her die on the big screen here—and die gruesomely, buried in the earth, and then all caked in dirt when Superman pulls her out—was an all-time shocker. This makes the catharsis all the greater when Superman brings her back. To sum up, Superman the Movie is several films in one. The Kryptonian scenes, though unsatisfactory to me as a comics fan who grew up with a different conception, are still well done in their own way. The brief Smallville episode is excellent, with Glenn Ford as Pa Kent delivering the key line, “You’re here for a reason.” The Metropolis scenes have their ups and downs, but the better ones make the movie while others tend toward silliness. Finally we have the Lex Luthor plot, and the movie commits dramatic suicide. If Superman is here for a reason, it surely isn’t to do battle with the spiritual equivalents of Larry, Moe, and Curly Joe! I’ve already made my case for why the film can’t be categorized as camp. Even so, was it funnier than it should have been? In my view, no. For nearly the entire first half of the film, there’s virtually no humor at all. Certainly not in the destruction of Krypton, and next to nothing in Smallville—Clark outracing the train and the young Lois Lane’s appearance, maybe, but that’s it. The humorous bits only come in the back half of the film, with Otis and some other bits of big-city hijinks. The best dramatic productions will give you moments of levity like this, to both lighten the mood, however briefly, and give the dramatic moments more punch later. In today’s cinema, Marvel films tend to be superior to their DC counterparts for precisely this reason. As a well-known comics aficionado within my circle of family and friends, it’s a question that I get quite often. And whenever the question arises—that is, what I think is the greatest superhero movie of all time—the answer comes easily and immediately: the original Superman. I recognize the younger crowd out there is unlikely to agree with me. Superman probably feels quaint to them when they size it up alongside a modern Marvel film, but that’s because younger people will have a very hard time grasping what this film meant in the context of its time. It broke all the rules that had preceded it and became a monster blockbuster in the process. It was the first superhero film to take its subject matter seriously. 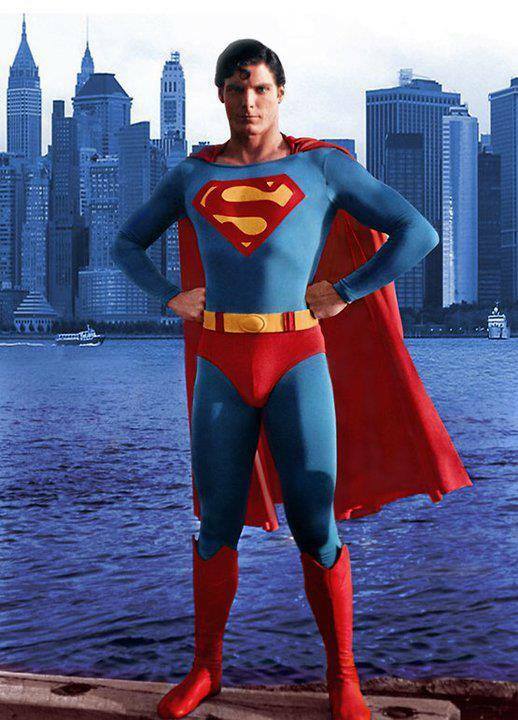 It was fairly faithful to its source material—when you watch this movie, Christopher Reeve IS Superman, the same character we all grew up knowing and loving. There’s even deeper artistic symbolism in the film, particularly in how Superman comes to Earth from otherworldly parentage to save us from ourselves. The original Superman film was THE game changer for superhero film properties, plain and simple. It made every other superhero film possible, and without it I’m not sure we’d be where we are today.